Be it a thrill-chasing activity, a mystical tarot-card reading sesh or a calming pottery workshop, we’ll tell you exactly where to go for ‘em. Skip to this list of places for indoor activities (it includes an arcade centre, a trampoline park, ice skating centre, soap football, escape games and more) or go rock climbing, go-karting, shooting, off-road biking or paragliding over here. If you’ve got a large group to hang with, don’t miss paintballing at any of these places or Oh My Game (there are two outlets in Gurgaon) for a round of laser tag. There’s also Zorba The Buddha–in addition to being absolutely stunning, they host regular workshops and events that could range from pottery, astronomy, past-life regression, meditation, contact improv-dance, drum circle and more. Maker’s Asylum in Hauz Rani hosts weekend workshops for wood-working, jewellery designing and prototyping. And since we possibly couldn’t miss out on the most obvious answer to ‘fun places’ - here are some awesome amusement parks you can visit. Delhi’s a shopper’s paradise and there’s nothing you can’t find here. Visit Janpath for beautiful trinkets, Khan Market for designer clothing, Sarojini Nagar for budget clothing and Dilli Haat (there’s one in INA and one in Janakpuri) for beautiful handicrafts and food from multiple regions of the country. They also host ample festivals regularly, so there’s never a dull moment. Bored of the usual cinema halls? Head to any one of these off-beat movie screenings or watch actors on their best, live in these theatres. Art lovers, the best bets for you are the Indian Habitat Centre (exhibitions are a regular deal here) and the National Gallery of Modern Art. History buffs can always go museum hopping (we’ve got a list of them all here). The National Science Centre and Nehru Planetarium are our personal favourites (they’ve saved us from having to learn science in school the boring way). Stand-up comedy bingers, get off your lazy bums and watch them live at either Canvas Laugh Club in Gurgaon or Playground Comedy Studio in SDA. Kingdom of Dreams (although a little expensive) is where you can watch live musicals, shop and eat from multiple cuisines. We’ll save you from a long read since we’ve already made a list all the best spots across the city. 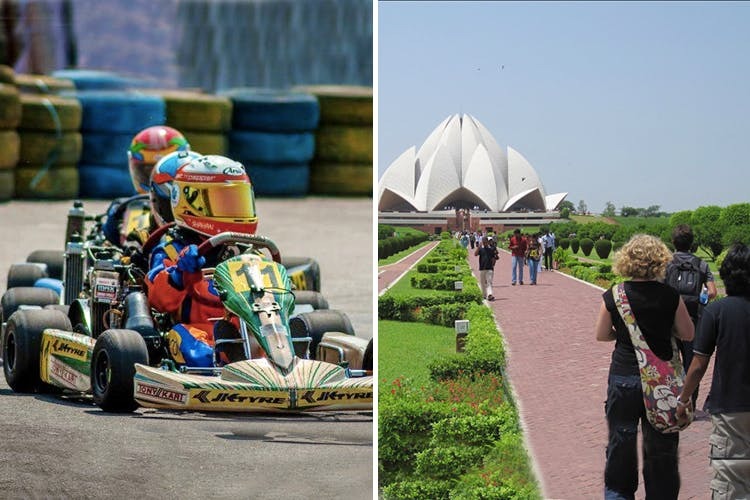 But if we had to pick one, it’ll be the Raisina Hills area which covers Rashtrapati Bhawan, Rajpath and India Gate (and grab some ice-cream there). Akshardham Temple is also a must-see, since it’s a one-stop for experiencing beautiful sights, a movie, a light and sound show, a boat road, an exhibition and more. A fun way to explore is to book a group tour. SpinMonkey does cycling tours of Old and New Delhi and we can’t rave enough about it. Or, do Dilli darshan in style via this Segway tour. With such a rich food culture, you can’t come to Delhi and not go on a food trail, especially to Old Delhi and the Nizamuddin Basti. To taste the most delicious grub, go for a guided food walk with Delhi Food Walks. Having dishes like fire paan or ice paan at CP or Turkish Ice Cream in Noida are an experience of their own. If your idea of fun is more on the side of downing shots and dancing away to trippy music late into the night, here are six awesome nightclubs.